Forget about the crash of 2008, because the real estate market is coming back in full force. Real estate agents require sleek sites to display new homes, apartments, and condos and quick search tools and mapping functionality. Not to mention, real estate blogs are popular websites, offering content for home buyers and investors. The curated real estate WordPress themes on this list can live up to any challenge you throw at them. The best themes have sleek, modern designs and powerful search tools, but what other features are considered must-haves? What Should Come With My Theme? A blog area is a must since fresh content brings more clients, but you also need to think about features that are specific to those in the real estate industry. For instance, a theme that offers MLS integration is a necessity. You should also consider themes that include custom widgets for inserting real estate listings into your content or sidebars. Social media integration, maps, and prominent call-to-action and contact forms are also useful. What Makes WordPress the Obvious Choice? WordPress is a very popular CMS that is easy to setup and maintain. It also has a ton of plugins that can be used to extend functionality. Several real estate-specific plugins exist as well for further customizing your site. Producing a lot of content is imperative for your site’s success, so having a platform like this that makes it easy to add blog posts and pages on the fly is a major plus. Now, read on to learn about the best agent, broker, and agency themes on the market. 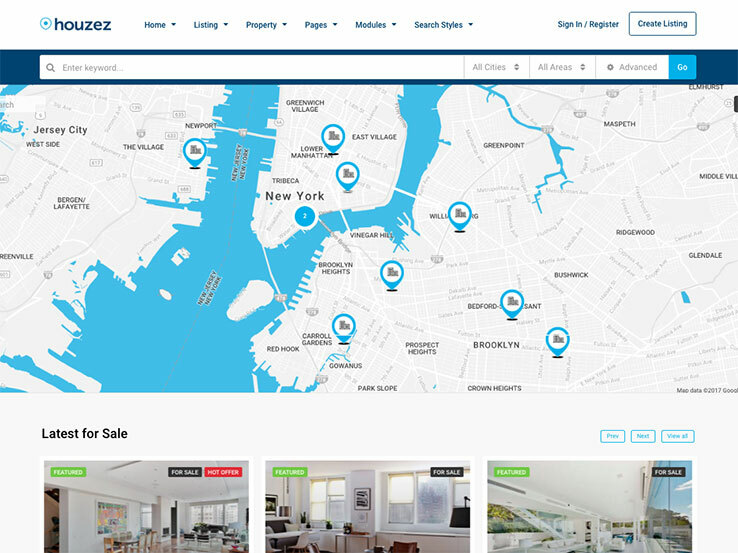 Houzez is a multipurpose professional real estate theme designed specifically for agents, brokers, and agencies. Packed full of great niche-related features, this responsive theme will have you selling houses, gaining clients, and building a bigger business in no time. To start, Houzez includes the premium Visual Composer plugin for easy page building, multiple header options, listing and property templates, and a private messaging system. Moreover, it has parallax backgrounds, unlimited custom colors, Google Maps integration, and translation ability, all of which help appeal to site visitors and keep them engaged. Additionally, this real estate theme does more than just display your real estate business to the public. It also has a built-in management system for maintaining a real estate marketplace, coordinating with your own agents, and accepting property submissions. 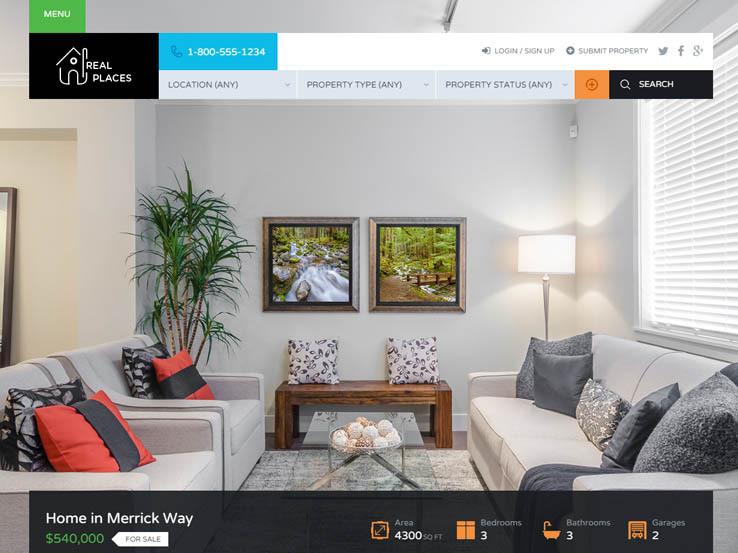 Supporting virtual tours, property videos, and gallery images, as well as an agent profile section, payment gateways, memberships, and more, this real estate theme is the one for you. When it comes to Real Estate, everything that really counts is actually making a sale. Quick Sale WP Theme is made specifically for that. It is very convenient now to show your customers the best offers with Gallery Styles. The theme has Online Booking and WooCommerce to keep your books in order. 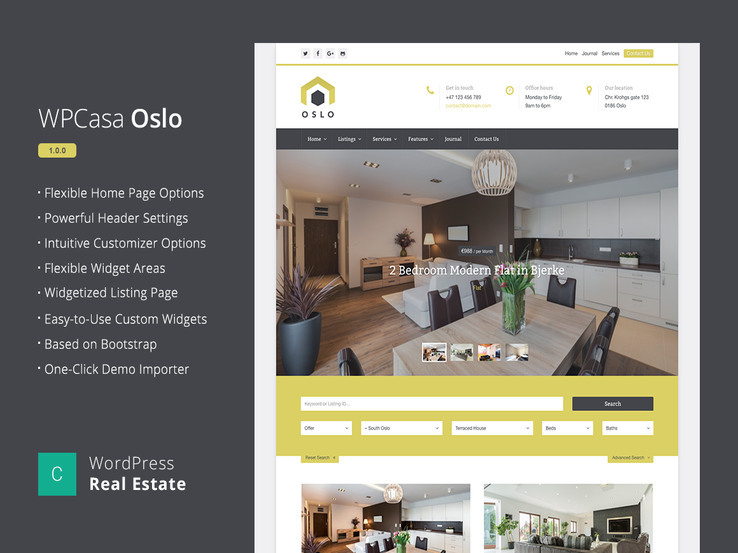 Oslo enjoys a well-planned layout to maximize the conversion rate of your real estate website. Features like the large slider on the homepage, advanced search, necessary details on the archive pages will help the visitors find out their desired property in no time. You can get started with any of the readymade homepage layouts or create your own design. The intuitive theme customizer section offers all the styling options you need. Feel free to use the custom widgets to enhance the user experience. The fully responsive theme also offers several premium add-ons to get additional features. London offers a unique mix of high-quality images and the necessary information, both of which are critical for any real estate website. Visitors can browse the available properties or use various filters like the location, price, number of bedrooms, and baths to find the suitable listings. The built-in header settings options will enable you to set unique headers for different pages. You will find all the customization options in the theme customizer panel. The SEO-optimized theme also features a mobile-ready design and lots of custom widgets. 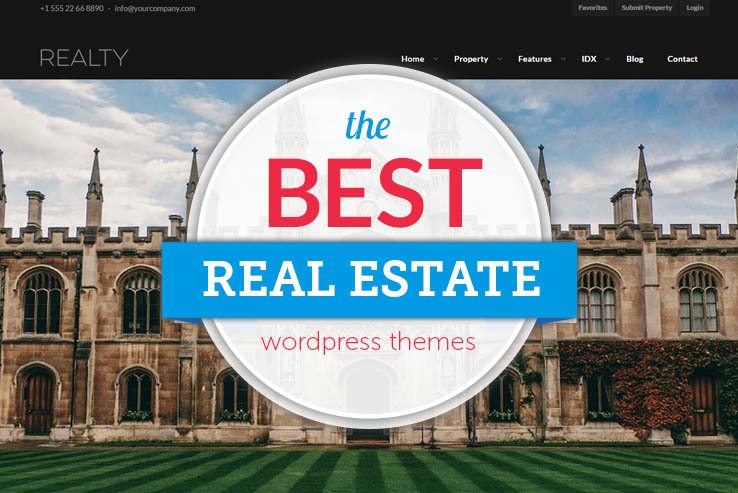 Real Places is a modern real estate theme from InspiryThemes, the same company that brought you the popular Real Homes theme which you can read about in our list. This theme developer has a proven track record when it comes to building beautiful, feature-rich themes for use by realtors, brokers, and agencies. They have sold over 24,000 themes with over 10,000 of those going to the real estate community alone. The Real Places theme includes far too many features to list them all in this review, but a few notable ones are the advanced and customizable search for real estate properties and the beautiful flat design. The search feature allows your clients or potential clients to submit complex multi-input search queries that include a price and size range. The theme will then display the returned data on a customizable search results page that can include a Google Map with results pushed to markers. The design itself is clean, bright, and incorporates elements from both the flat and metro design movements. 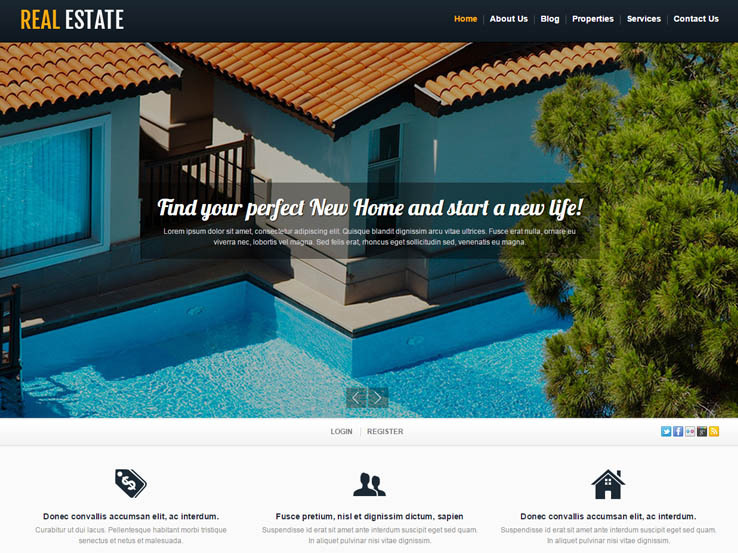 If you can only check out a couple themes for your real estate website project, this theme should be on your list. 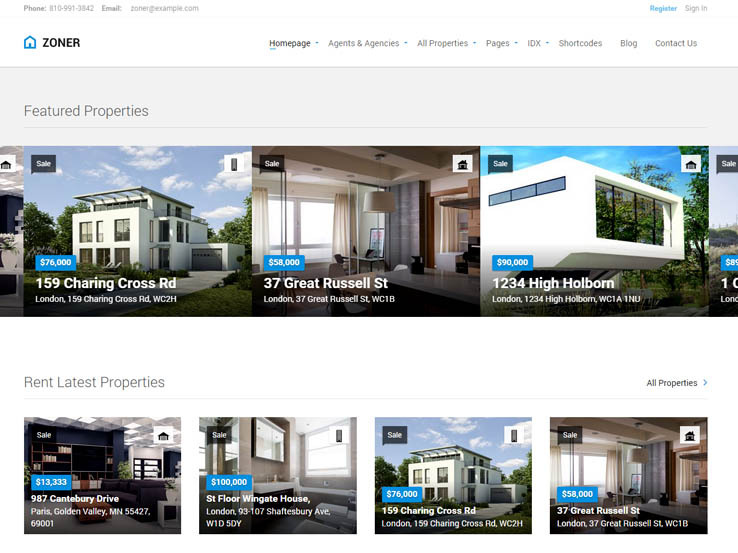 The Real Homes theme is a premium option with powerful property searching. The theme provides both simple and grid listing formats, meaning that you can choose how to display your most recent listings. Use custom widgets to add items like social media buttons and enjoy all the benefits of the responsive nature of this theme. The Visual Composer is one of the best features, since you don’t have to worry about dealing with any code. Simply use the plugin to list your new homes and leave the design work to the template. Use the Revolution Slider plugin to display a series of images, whether you want to feature the interior/exterior shots of your property listings or show the members of your team. 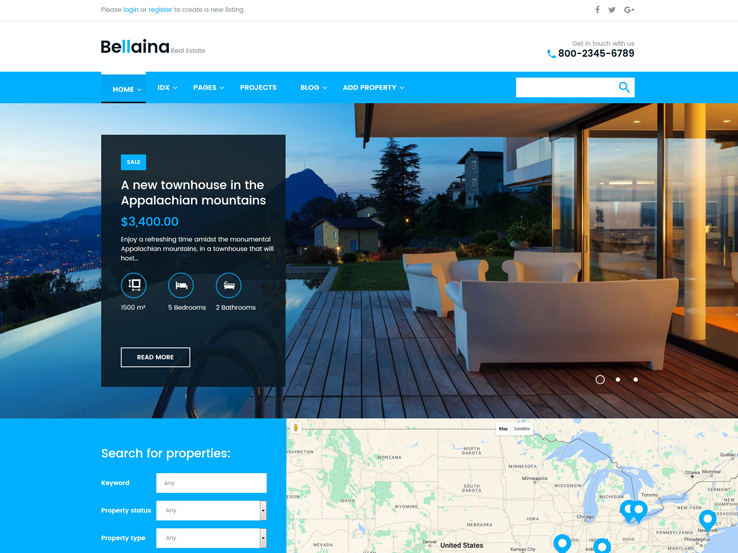 Bellaina is a fully-featured WordPress theme running on a 100% responsive framework. Intended for real estate agents and large corporate sites, it is pre-loaded with all features, plugins and extensions needed to build a powerful online presence. The theme comes with iDX support. On top of that, it is pre-loaded with Cherry Real Estate and Cherry Property plugins, both of which are custom-made by TemplateMonster’s Cherry team. The theme’s layout is quick and easy to navigate. Thanks to the advanced property search form, people will feel the ease of coming across the necessary offers in the shortest period of tune. Moreover, Bellaina is integrated with Google maps widget supporting localization feature. By clicking any marker on the map, people will be introduced to a more detailed review of the chosen property. Bellaina is licensed under GPL v3.0. The latter gives you the freedom to install the template on an unlimited number of web resources. The code can be also tweaked in a variety of ways. The theme is built with Power. This is another TemplateMonster’s custom-made tool. Thanks to the intuitive drag-and-drop page builder, webmasters can create versatile layouts without touching a line of code. A number of content modules, custom widgets, and pre-designed page layouts are also added to the theme’s pack. 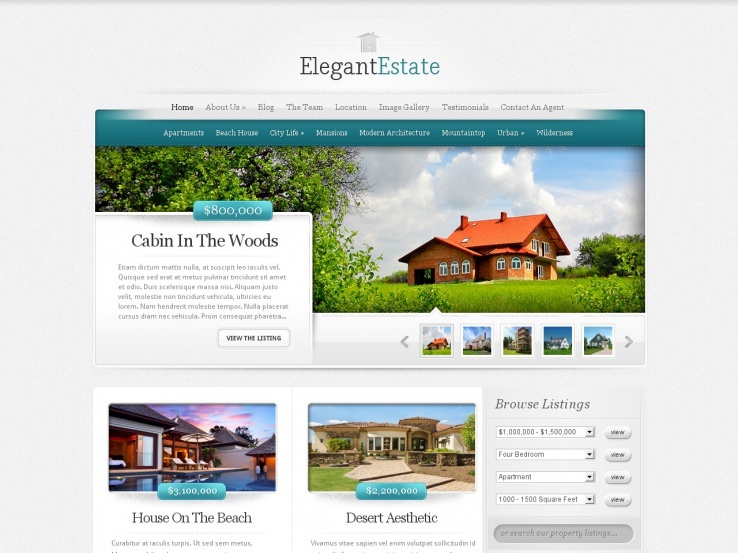 Try out the ElegantEstate Real Estate WordPress theme, an Elegant Themes product. The company is known for putting out some of the most attractive themes on the market and you only have to pay a small subscription to receive access to all of the themes. The theme lets people browse your real estate listings with ease, and you can place special property information like photos, Google Maps, and descriptions. The five unique colors are essential to adding your own style and the complete localization is great for translating your website to another language. The theme also offers shortcodes that allow you to add extra design elements without touching a single line of code. Purchase of a membership at Elegant Themes comes with many benefits beyond getting access to this high-quality real estate theme. You’ll also be getting access to almost one hundred themes for businesses and bloggers. Lately, Elegant Themes has added a wonderful set of plugins to their membership plans, bringing additional value to their already powerful subscription. 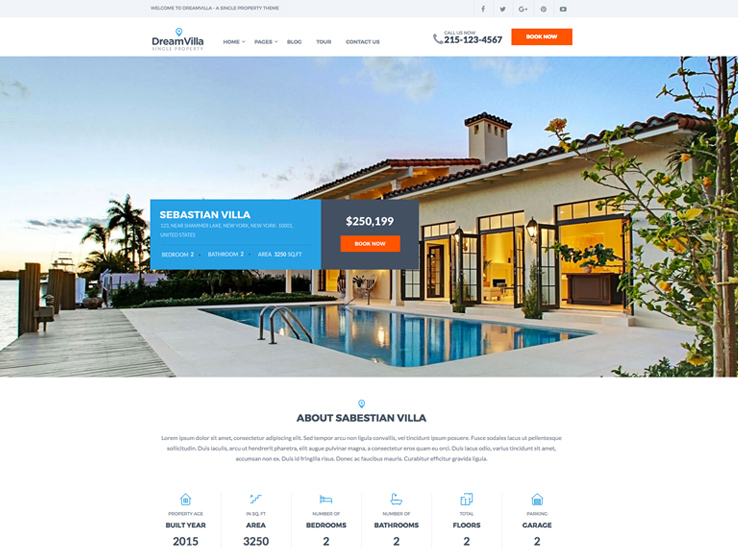 DreamVilla is a modern and trendy single property premium WordPress theme best suited for your premier listings or private homes for sale. This theme is packed with features to highlight your property’s best qualities. No matter what type of property you’re selling, DreamVilla will show off its best features. The theme comes with three different homepage layouts to choose from, as well as a single-page parallax layout and a multi-page layout. The theme is fully responsive so you can rest assured your listing will look great on any device. To give you a jump start on setting up your website, DreamVilla has a one-click demo install feature that will import all the demo content you need. All you have to do is replace the information with your own. DreamVilla was built with Visual Composer Builder, which makes customizing the theme a breeze and allows you to build unique and stunning layouts. Plus, you can take advantage of the built-in Revolution Slider to capture your visitor’s attention and put the focus on the most important features of your property. You can customize your color scheme completely and add FontAwesome icons to highlight different sections. This theme includes plenty of great built-in features, like a custom “Near By” Google map that shows what amenities are near your listings. Sortable galleries make it easy to add stunning images of your property’s rooms, garden, or pool. Floor plans can easily be displayed on the homepage, as well as on a separate page for a more detailed view. DreamVilla comes integrated with the WP Quick Booking Manager Pro Plugin that will allow you to rent your property and get payments online with PayPal. Other features include Google Fonts, Twitter live feed, advanced theme options, and 1-click installation. On top of that, DreamVilla includes the PSD files so you can experiment with the design before bringing it live to your website. 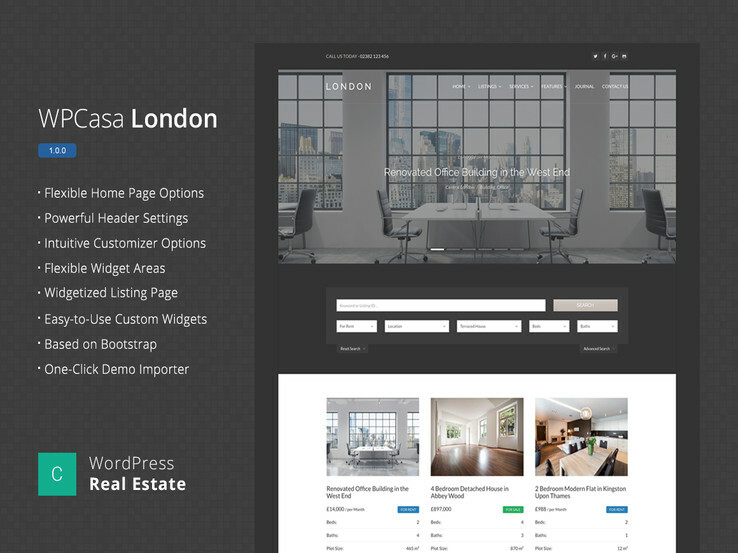 The Realia theme is a responsive real estate theme well known for its dsIDXPress plugin support. This plugin is one of the most popular MLS real estate search plugins on the market. The front-end submission feature lets your visitors submit their own listings. The real-time design changes are a must-have in real estate, which means your website will always be up-to-date since any updates to your listings will be immediately visible. Easy property management tools will allow you to add listings within minutes. Over 500 design combinations will make your site stands out from the competition. Choose from 30 colors, 10 backgrounds, and 3 headers. The PayPal integration is an interesting feature because you can charge you customers per listing. On top of that, the theme comes with a thorough documentation should you need any help in setting it up. Consider the Real Estate Agency theme if you’re interested in a responsive real estate theme with sleek and modern design elements. The responsiveness works well for people trying to view on tablets and phones, while the fully editable layout allows you to change anything from typography to sidebar positioning. Custom post types and formats allow you to add a variety of content such as links, galleries, images, and more, while the multilingual nature of the Real Estate Agency theme ensures that you can easily translate your website into another language. The theme provides over 80 shortcodes, which is nice for those who don’t have coding experience but still want to quickly implement things like columns, buttons, and tabs. Real Estate Agency provides a two-step installation process along with multiple color options for branding your site to perfection. The portfolio area is ideal for showing off your most recent listings, and the custom widgets allow you to add comments, social sharing, and more. Real Estate Agency offers customized typography with over 600 Google fonts, and the Fantastic Sliders enable you to feature your best properties or to direct people to your most important pages. The Zoner WordPress theme is a responsive real estate theme with front and back-end interfaces that make it easy to customize your website. The ability to let clients create profiles while also accepting payments and sending out invoices are just few of the features that make this theme stand out. The theme includes a social login for quick sign-ins and you can even create agency and agent profiles to add a personal touch to your company website. The Zoner theme integrates well with Google Maps and OpenStreet Maps so that your customers can always find the properties they are looking for. Email templates and contact forms are included in the theme, which makes it easy to stay in touch with potential buyers. Zoner includes the Visual Composer plugin, which is a drag-and-drop editor handy for beginners and advanced users since you can easily edit any page layout. Additionally, you receive 14 PSD files if you’d really like to customize every aspect of your website. 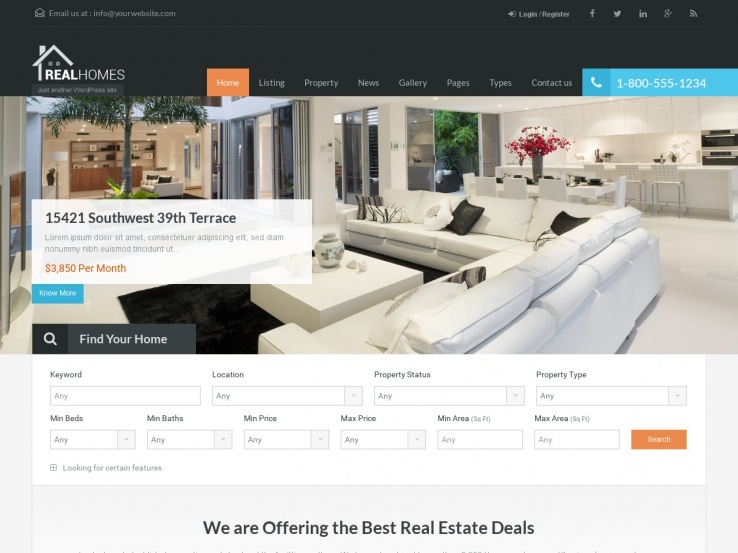 The theme has 15 homepage variations that help create a unique platform for your real estate business. On top of that, the translation-ready nature of the theme helps you connect with people who speak different languages. Along with demo content and a property compare tool, the Zoner theme is exactly what you need for a real estate company. The AgentPress Pro WordPress theme comes from StudioPress, which means that it runs on the Genesis Framework. This framework is one of the best ways to make customizations on your site without losing changes when the theme updates. 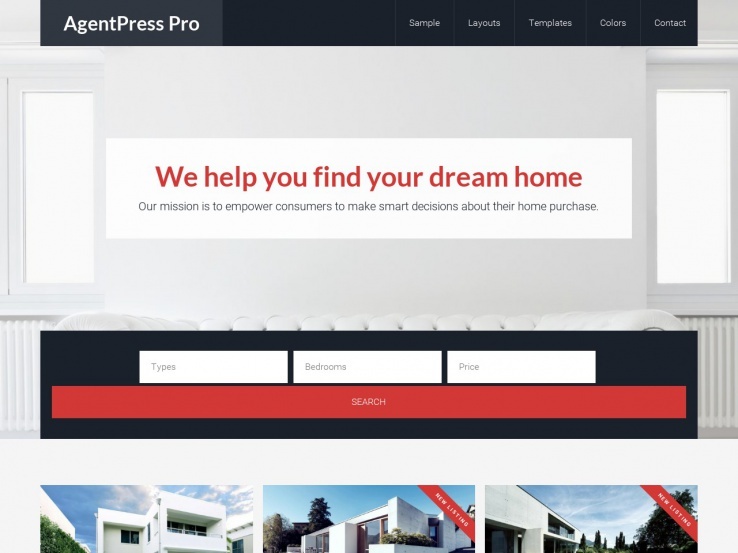 AgentPress Pro is a responsive theme, which is ideal for those who want to view your real estate posts on mobile devices. A beautiful header and slider area combines the needs for visuals and contextual information. You can implement a large email subscription form at the top of the site, allowing you to stay in touch with your potential clients. The four color styles are ideal for adding your own branding and different layout options add variety to your pages. This theme lets you change out the custom background, which is a nice feature that can be used to highlight a picture of a cool home you’re trying to sell. Additionally, custom menus and headers make your site easy to navigate and allow you to upload your own logo or a header image. You’ll also notice that featured images are automatically cropped and cut down to reveal an image before someone clicks on one of the blog posts. The best part of the theme is that you can implement a search bar area towards the top of your site, which allows your visitors to filter through the listings according to price, type of real estate, and number of bedrooms. 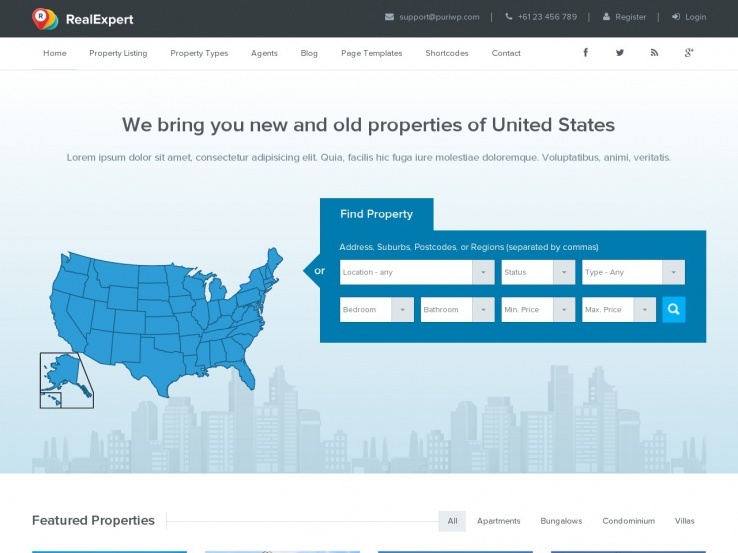 The Real Expert WordPress theme is a great choice for any real estate business. This is a completely responsive theme that looks great when viewed on mobile devices. Over 50 country maps are packaged into the Real Expert WordPress theme, which is a wonderful bonus considering most real estate agents in any location can use it to sell homes. A dummy content file makes it easy to set up your theme to look like the demo, meaning you don’t have to start from scratch. The three homepage templates are nice for standing out from the competition. You can choose from unlimited fonts, which is a nice way to add a touch of your branding to the website. Unlimited colors are available that further complement your brand. The advanced property search helps out users to quickly locate homes in their area. Analytics and SEO is built right into the theme and several shortcodes are available to quickly add items like buttons and columns, meaning you don’t have to touch any code. 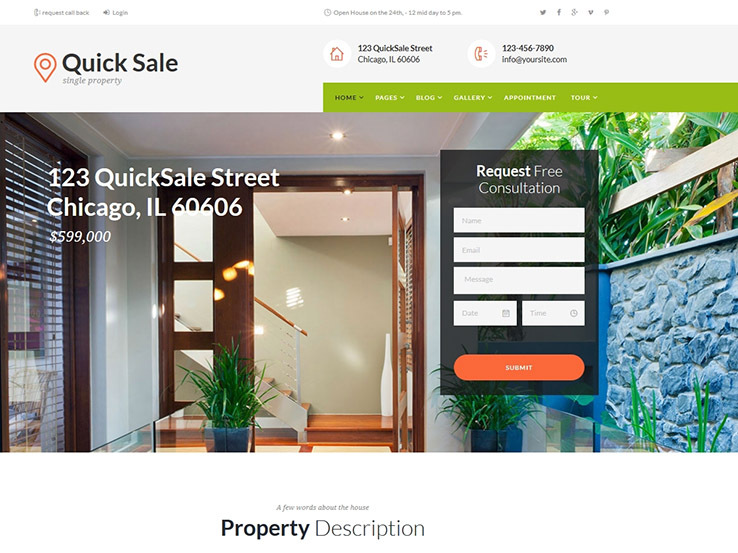 Front-end submission is included so visitors can easily submit their homes for sale. The custom widgets increase the effectiveness of your site, allowing you to add extra content like recent property location, social media, latest posts, and tabbed content. Overall, the Real Expert WordPress theme is one of the hottest options out there, so give it a try. The OpenDoor WordPress theme has a real estate mode and a car dealership mode. It’s a beautiful design with a responsive layout, making it easy for anyone to view your content and all the properties you offer even when they are on the go. An advanced search tool helps visitors locate their dream home while the highly customizable front-end is great to add your own branding to the website. Two slideshow layouts are included to display images of your most recent housing listings. You can choose from full-width or regular layouts and a comparison tool serves as one of the more useful modules for quickly comparing two or more listings’ properties. Google Street view is integrated directly into the theme. It only works when Google Street view is available for a particular home, but it’s one of the more convenient options when people would like to see exactly what a home looks like without walking directly up to it. Finding a listing is done by browsing or searching the site, and people can filter based on certain items like if a home has a back patio, an attic, or swimming pool. Several social media buttons are packaged into the theme allowing you to connect with potential buyers on social media. All of your recent listings are placed on the homepage, and each of the listings show the pricing, the location, and details within a small square. You can even include a loan calculator for users to see how much it’s going to cost them per month to buy a home. Along with a fully integrated blog and some other nice widgets, the OpenDoor WordPress theme has exactly what real estate agents need to get the word out about their business. 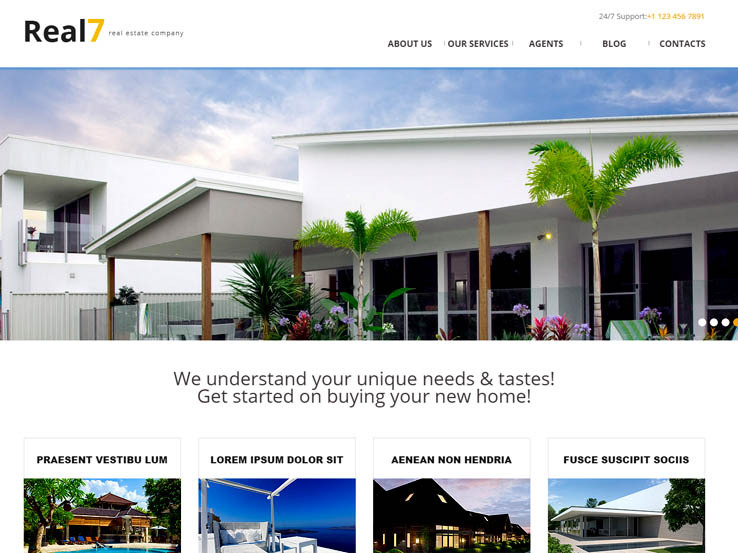 White Real Estate WordPress theme is sure to capture the attention of your visitors with a gorgeous full-width slider that has eye-catching animation effects; it’s a great way to showcase your properties. The theme is fully responsive so you can rest assured your website visitors will be able to view your property listings even when they’re using their phones or tablets. You can easily highlight your agency services directly below the slider and use the column-layout below to feature your hottest properties. The theme is completely customizable and includes custom post types to add variety to your content. Use any of the 80+ shortcodes to add more complex design elements without needing to touch a single line of code, and use the translation files to translate your entire website to another language. You can easily customize the typography with Google Fonts and use custom widgets to add social sharing features, recent post lists, and more to your website. 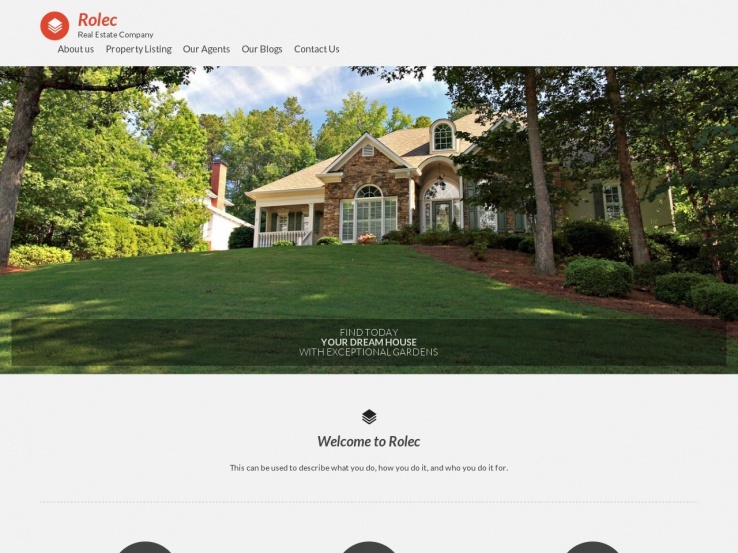 Rolec is a beautiful, responsive real estate theme that has all the features you need to create a successful real estate agency website. Use the full-width slider to instantly capture the attention of your visitors and showcase your best properties. Display a brief welcome message and highlight the best features of your agency directly below the slider. Add recent listings in a column layout below and don’t forget to include testimonials to build your reputation. The theme is fully responsive and includes advanced search functions based on taxonomy terms that are controlled in your dashboard. Feature your agents along with their bio, social media profiles, and a photo. The theme is built on top of ZetaOne framework which makes it easy to customize every aspect of your website and it includes unlimited color schemes so you can easily incorporate your own branding. You can easily customize the layout of any page and include all the relevant information for all the properties you manage. Rolec is truly an impressive theme that meets the needs of any real estate agency. 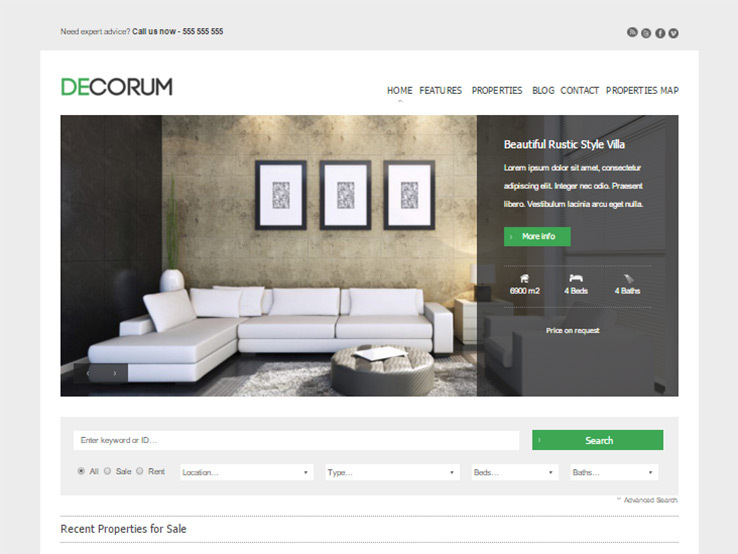 deCorum is a complex and feature-rich real estate theme. It has a responsive and elegant design that includes a beautiful slider to feature your most popular listings. Every listing featured in the slider has a text overlay that you can use to highlight the most important features of the property. The entire homepage is widgetized, which makes it easy to add content blocks to create your layout. The homepage also includes a powerful search bar that lets visitors search for properties in a particular location based on type and features. deCorum also includes custom post types that make adding real estate listings a breeze. 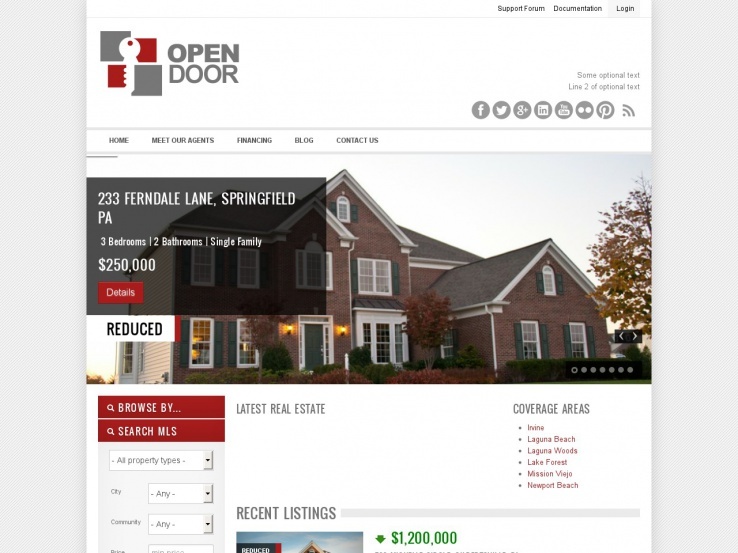 Custom page templates allow you to display your real estate website content in a professional and appealing way. deCorum provides plenty of customization options as well, which include the theme options panel and widgets. They make it possible to edit the layout of your website without touching a single line of code and to incorporate your own brand for the ultimate customization. Nice collection. I was searching for a list of themes for Real Estate and came across your article. Its really helpful and some themes are really inspirational if someone is looking to build themes from scratch. Even users may also design themes from scratch using a templatetoaster. It’s also a useful resource for users who have less or no knowledge of coding those users can easily design themes as per their requirements and for professional designers, it can save lots of time of them if they use such designing tool. Thanks for sharing. 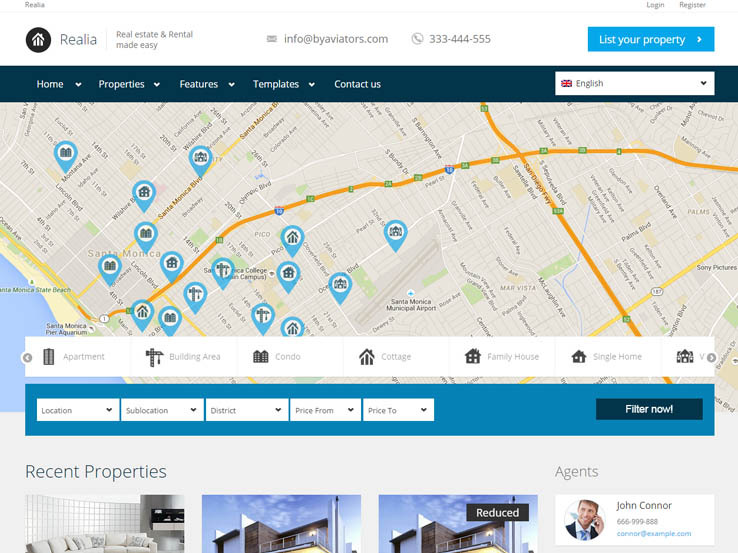 Superb collection of Real estate WordPress themes. I really appreciate your efforts, all themes are really awesome, I will use one or two from this collection or will try to design it by myself using a designing software templatetoaster. p.s. The Elegant Estate Theme is NOT responsive (although it is a beautiful theme)..
Great list! I am looking to start a niche real estate classified website as a business, I am not a real estate agent but would like to run this site as a portal. Any suggestions on the best theme for this purpose? Pretty overwhelming to find the right one. Any feedback would be greatly appreciated. Thank you. Great list of Real Estate themes. Luxor looks like a very powerful theme loaded with tons of features. Thanks for suggesting it to our readers. Congrats on the new release of your theme! We will definitely check it out. Thanks Adeel for the suggestion, we will keep this in mind for a future update to this list. i need to built a website for estate agency, I’ve checked multiple sites and noticed grate features for searching with map drawing on rwhitley.co.uk this site. can you please advise the best theme with plug-ins to create something similar. i am also interested to offer users to upload their properties which should displayed after site admin approval. i don’t know what is that but heard a way where user upload or remove a site on their website and it appears on rightmove as well. (some sort of integration). i need that as well. please also advise if you know any better theme with these plug-ins. i want site to be lite and easy loading on pc or mobile. Many Thanks in Advance. Thanks, did you have a favorite? Can someone here steer me to the kind of theme or web platform I want? About me: I am a real estate professional. Part agent, part investor, part homebuilder. I’m a former journalist and a decent writer. Not much of a techie, but patient and willing to learn. Also willing to hire a low-cost web pro to help build and maintain sites. I want a look like the News app in Windows 10. (I think I’m describing that accurately.) It’s one of the apps you can choose when you click the Windows icon. (Others apps are Food & Drink, Health & Fitness, etc.) I’d provide a link to it here, but I don’t know if that’s even possible. That Microsoft app displays individual news stories in square-ish boxes sprawled across the screen. The top row shows two big “lead” stories side by side. Below that are many rows with five news boxes per row. Each box of course is a clickable link leading to the full story at some outside source. I think this sort of presentation would suit my business well. It’s a soft sell approach to real estate, promoting our company but mixing our own content with interesting, curated news. I write some of the content. I’d want to mix it frequently, adding and deleting stories. One more thing. My site would need an IDX plug-in. IDX is the sort of “internet data exchange” feature you see on realtor web sites, enabling users to search for properties. The IDX links to the local MLS, or multiple-listing service. There are many IDX providers out there, maybe hundreds. Other than that, I don’t want a lot of typical realtor features. It would be a realtor site masquerading as a news site. Any ideas on where to go? Hi Tom,\n For your particular needs, I think you might be better off with using a Magazine or Newspaper theme versus a Real Estate theme. To start your search check out these, Best Newspaper Theme roundup, Best Magazine Themes roundup, and Best Minimal Magazine roundup.\n\nOnce you find a theme that will work, I would contact the foundry to ensure the IDX plugin will be compatible with it.\n\nGood Luck with your search! Fantastic list of real estate themes. I know it’s a donkey task to find best real estate property management theme list online. And you did it really awesome. Thanks for your hard work. Thanks! Did you find a theme you are interested in using?